Speaking at the launch of the book "Beyond the Name", celebrating the life of the late Chief Justice of India Y. K. Sabharwal, Chief Justice Ranjan Gogoi on Monday articulated that it is the task of the judge to place the text of the law in the context of life. "A majority of those associated with the law and the courts are oblivious to the experience of the litigant, the journey they undergo in their endeavour to secure the right of audience in the hope of getting justice...but the judge who determines their destiny is witness to their fortitude...", he said. The Chief Justice hailed the late CJI Sabharwal for his dauntless stance in perpetually upholding the rule of the law, the spirit of the Constitution and the independence of the judiciary. Acknowledging that an address which is only a few minutes long could not do justice to his contributions, Chief Justice Gogoi recounted a few of CJI Sabharwal's celebrated judgments- the 2007 verdict in I. R. Coelho, where he led a a nine-judge bench to unanimously extending the scope of judicial review to any law found to be in the teeth of the basic structure of the Constitution, as envisaged in the fundamental rights, even if it finds a place in 9th schedule to the Constitution; the 2007 Raja Ram Pal case which raised the power of judicial scrutiny to hitherto unimaginable heights by making it possible to call in question in the appropriate court of law the validity of a proceeding inside the legislative chamber; the furtherance of the environmental law in T. N. Godavarman; and the order urging the Delhi High Court to consider on merits Naz Foundation's challenge to section 377 of the IPC on the ground that the abridgment of Fundamental Rights cannot be merely an academic question. Chief Justice Gogoi recalled how in one of the lectures delivered by him, Justice Sabharwal had expressed the need for advocates to deem themselves as public servants, for them to believe that the law they invoke is not their own but that of the people, and that the power they wield by virtue of their knowledge of the law comes with the duty to secure justice not just for a selective few but for all. The function was attended by Justice A K Sikri, the second seniormost judge of the Supreme Court. 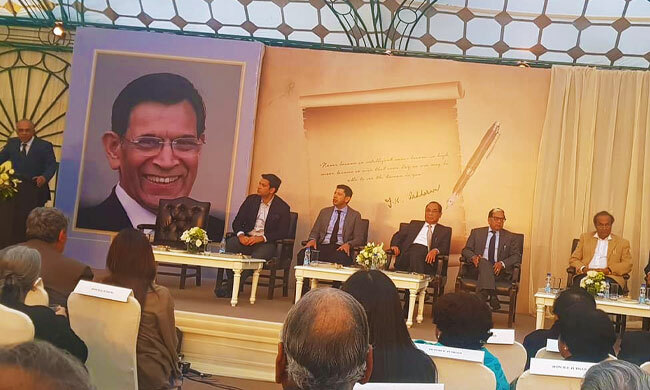 In his turn, Justice A. K. Sikri recited an excerpt from the book itself- that if one is affected by the little things, then their mind is still little, for great minds are not hurt by petty, everyday things.